Dessie Teff is a new warm season annual grass variety developed for high forage production and forage quality without the problems of other summer annual grasses such as prussic acid or nitrate buildup. Dessie makes the ideal hay for horses with great palatability, digestibility, a mineral content high in calcium and iron and an attractive green color which is important for the premium horse hay market. Dessie is widely adapted throughout the United States and will tolerate drought conditions as well as wet soils. 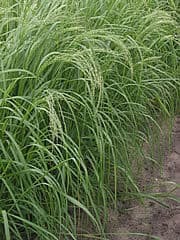 Dessie is a low input crop that has very few disease or pest problems and does not require high amounts of fertilizer for optimum production. Remember, for profitable summer forage production, Dessie is the answer.